Full Buckle – FB: A custom made carrier (often a wrap conversion – WCFB), with waist and shoulder strap buckles. Half Buckle – HB: A custom made carrier (often a wrap conversion – WCHB), it adopts the style of the mei tai but with a buckle at the waist instead of ties. Mei Tai – MT (eg. 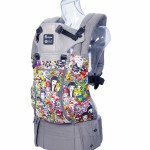 Babyhawk, Melkaj): An Asian-style carrier that is tied, it has a body panel with two long straps arm straps coming from the top right and left-hand corners to tie with two waist straps coming from either base corner. Various sizes available: baby, toddler, preschooler etc. Some have padded waistbands, others not. Can be used for front or back carries. Onbuhimo – Onbu: Asian-style carrier, it is Japanese in origin. Similar to a Mei Tai, it has a panel with two arm straps, but it has rings at the waist through which the arm straps are threaded. It is also available in various sizes to suit the age/size of the child. Podaegi – Pod: Another Asian-style carrier, of Korean origin. The predominant style is similar to a Mei Tai, with a panel and arm straps but without a waistband. This often makes them a popular choice with pregnant moms who want to continue to carry their older child(ren), as waistband ties are often uncomfortable as they are tied across the bump. Ring Sling – RS (eg. Sakura Bloom, Sleeping Baby Productions): A length of fabric (can be made out of a woven wrap – WCRS) with a pair of rings sewn into one end. Used for one-shouldered carries on front or hip, good for newborns up to preschooler. Great for quick up-&-down carries of a tired-legged toddler. Many find this to be useful when baby is smaller (and less heavy). Simple piece of cloth – SPOC: Functions like a woven wrap, but is not produced specifically for the purpose of babywearing, so some people have concerns about safety. Use would depend on your confidence about the suitability of the material. These are often homemade. Soft Structured Carrier – SSC (eg. Ergobaby, Beco, Tula, Lillebaby): Similar in principle to a Mei Tai, but instead of having straps to tie, this carrier has buckles. Can be used for front and back carries. 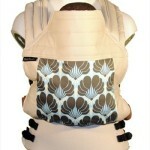 Padded shoulders and waists help with ergonomics and back muscle strain. Avoids the problem of dangling straps dragging on the ground! Stretchy wrap (eg. Moby, Kari-Me, SaBe, Solly, Boba): A length of stretchy fabric that is tied. Great for newborns and little babies, but can become less useful as baby gets heavier (due to stretchy material). It is pre-tied onto the adult and the baby is then popped in and out throughout the day, without the need to re-tie. It is generally advised that this type of carrier is not suitable for back carries. Woven wrap (eg. Didymos, Girasol, Hopp, Oscha): A length of woven fabric, sold in a variety of sizes, which is tied into place. Can be used to carry from newborn to preschooler. A woven wrap would be suitable for front, back or hip carries; there are a number of different carries. Wrap Conversion – WC (eg. Ocah, Opitai, Softai): A carrier custom made out of woven wrap material. These are often done in the style of the Asian carriers mentioned above, or a ring sling. 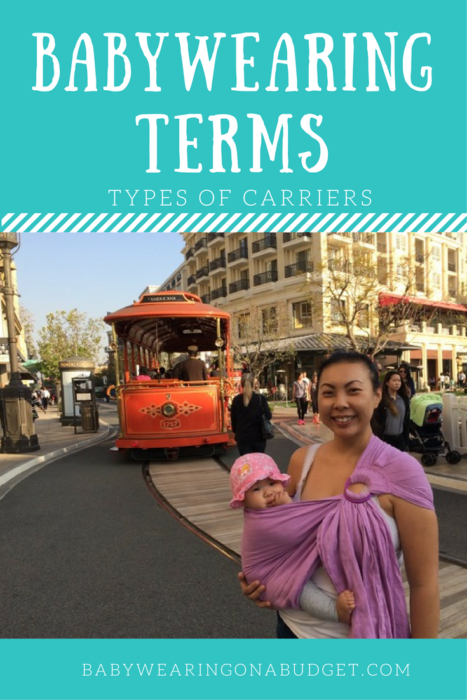 Note: There are many terms, lingo, acronyms and definitions in the babywearing realm. Bookmark Babywearing International’s page – they’ve got a comprehensive list! * Special thanks to the So Cal Babywearers and Babywearing 102 Facebook groups for providing this resource, with modifications.